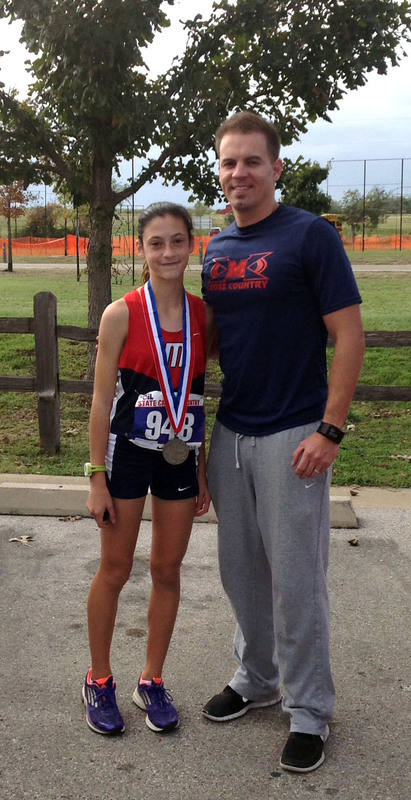 Freshman Julia Heymach received second place at the State cross country meet last Saturday. “I like to practice with my team, ‘Barrier’s Harrier’s’, because we all push each other to improve,” Heymach said. Many of Heymach’s team members agree that she is a hard worker and influences them to do their best. She comes into practice every morning at six doing the work outs consistently, encouraging the team to do better. To add to her success, after competing in the Regional meet, Heymach was selected as the Female Athlete of the Week for the Houston Chronicle. “I hope people see that I work really hard to get where I am and that it is just not natural ability.” Heymach said. During the District meet, Heymach broke the record for the three miles with a time of 17 minutes and 40 seconds, placing first and qualifying for Regionals. Barrier said that Heymach easily broke the record for the fastest time in the school. Heymach then continued to travel to Regionals and placed first again qualifying her for State. “I am excited for State and the competition because I know there are some really fast girls I will be racing against,” Heymach said. At State, Heymach felt good that she was running with girls that were keeping up with her. Heymach did a fantastic job placing in second with a time of 17 minutes and 49 seconds. In two weeks, Heymach will be qualifying for the Nike Cross Country Nationals in the Woodlands, and if she qualifies, she will continue on to go to Portland, Oregon for Nationals. Heymach is only a freshman, but would love to get a scholarship to a good college or university that has a fantastic track and cross country program. Heymach said she would like to eventually go on to the Olympics. “She brings out the best of the team making everybody better,” senior cross country runner Juan Moncada said.